DES MOINES, Iowa, April 17, 2007 (LifeSiteNews.com) - Former New York Mayor and Republican presidential candidate Rudolf "Rudy" Giuliani told supporters in Iowa that Republicans needs to "get beyond" pro-life issues and choose a candidate who can win the presidency in 2008. Giuliani - a candidate known more for his leadership during the 9/11 Islamic terror attacks than his liberal views - told Republicans Friday at a campaign stop in Des Moines that Republicans need to elect someone who will fight terrorism and keeping the economy growing. "Our party has to get beyond issues like that," said Giuliani in response to a questioner’s fear that abortion is dividing the party. "Our party is going to grow and we are going to win in 2008 if we are a party characterized by what we’re for, not if we’re a party that’s known for what we’re against," Giuliani said in reference to abortion. "My view of it is I hate abortion. I think abortion is wrong," said Giuliani. "Yet ultimately I respect that that’s somebody else’s decision and that people of conscience can make that decision either way and you can’t put them in jail for it." Giuliani’s comments - first reported in the Des Moines Register - created a furor among conservatives, who objected that they needed to gloss over their convictions and support a candidate not too dissimilar to the platform of the pro-abortion, pro-homosexual agenda platform of the Democratic Party. "Giuliani is saying that he has deep respect for all those people out there who want to throw pregnant women in jail. Has the mayor actually met any pro-lifers?" posted conservative columnist Ramesh Ponnuru on National Review Online’s The Corner. Nathanael Blake, writing for Human Events, described Giuliani as a "pro-abortion extremist" supporting both partial birth abortion and taxpayer funding of abortion. "Apparently, we’re supposed to just ‘get beyond’ the murder of 3000 innocents every day in America and turn our attention to the really big issues, like, in the words of one GOP sell-out, ‘fiscal responsibility and good management,’" said Blake. "If the Republican Party nominates Rudy, it will be the death of any principled conservatism." Besides his pro-abortion stand, Giuliani also supports the homosexual agenda, and as mayor of New York, he advocated special "rights" for homosexuals, marched in "gay pride" parades, and welcomed the "Gay Games" to New York City. 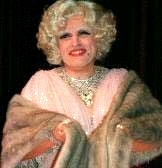 Giuliani opposed the Federal Marriage Amendment, favoring the creation of homosexual civil unions, and as a comic routine has appeared occasionally in drag since 1997. The aspiring presidential candidate’s cross-dressing gag is found all over the Internet and Youtube, including one drag gag featuring him being groped by Donald Trump. Historically, since Ronald Reagan in 1980 the Republican party has only won presidential elections by nominating candidates supporting the "right to life." Although Giuliani leads the pack of presidential contenders now, he may begin to lose considerable support as the party’s conservative base discovers Giuliani’s radical beliefs. Although polls are still fluid at the early primary stage, Giuliani’s abortion flap may have increased support for Arizona Sen. John McCain, who jumped double digits in an April 16 CNN poll tightening the race: Giuliani 27%, McCain 24%. An earlier LA Times/Bloomberg poll, showed undeclared candidate former US Senator and "Law and Order" star Fred Thompson taking second place to Giuliani at 15%, followed by McCain with 12%, and Mitt Romney with 8%.